40 years ago Rock’n'Roll changes the world. It changed the way people thought. The Rock’n'Roll of the 21. century are Mashups. They unite people and they pull down walls between people with different backgrounds. Mashups are more than a music genre. It’s a way of living. Be tolerant and open to everything and everyone that passes your way in your life. Live your ideas and ideals and be creative. Don’t let your government or your society allow deny your freedom in lifeor your personal evolution of creativity. It’s about time that we stand up as the GENERATION MASHUP to tell the world what’s going on. The only way to survive for a knowledge-based society is to allow and support creativity. Go out there and explain to your neighbours, your local politicans and your friends what mashups and the future of our society is about. This is what I am fighting for and I know that I am not alone. In your heads and in your hearts. 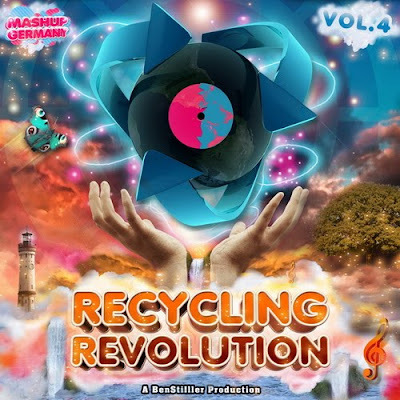 Thanks for sharing a very good post about "Mashup-Germany – Vol.4 – Recycling Revolution". Mash-Up Your Bootz Party Sampler blog post very nice. The matters listed for Recycling Revolution - CD1 and Recycling Revolution - CD2 was good idea. Keep it up the good work in this post. I enjoy this site, cool games and cool people use this site. thanks for sharing it.. .visit- POGO technical support also call Toll Free No 1-800-231-4635 For US/CA.